1: Thanks to the team at Auto Punditz for sharing these sales numbers with us! Thread moved from the Assembly Line to the Indian Car Scene. Overall Passenger Vehicle segment saw reported an increase of 2.7 per cent in domestic sales for FY19 to 3,377,436 units as compared to 3,288,581 units in FY18. The slowdown is expected to continue this Financial Year and Apr’19 – May’19 is going to be even more challenging citing the upcoming political conditions. 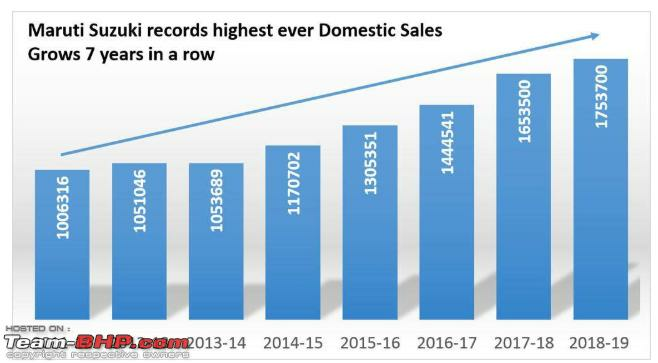 Maruti Suzuki reports highest total sales growth in FY'19 at 1,753,700 units, up 6.1 per cent, The growth for Maruti was supported by the Arena channel (6% YoY). Hyundai achieves highest ever domestic sales last fiscal at 5.45 lakh units a growth of 1.7%. Hyundai could post a flat growth (2%) and this too was possible with the introduction of the iconic Santro. Mahindra’s new launches helps in retaining the 3rd spot. Sells 2.5lakh units and up @2%over the previous year. Tata Motors grows 12%, and falls a spot behind Mahindra’s and sells 2.1lakh units. Honda grew a healthy 8% in FY19 owing to the tremendous success of New Amaze! While Tata posted the highest growth amongst all OEMs; It was Nissan+Datsun which seems to lost the track completely. The Passenger Car Sales de-grew -2.8% in Mar’19 v/s Mar’18. Due to muted demand and weak consumer sentiment; the Industry is under consistent pressure and last few months have been very challenging. All OEMs are now gearing up to meet the upcoming BS-6 regulations and CAFE (Corporate Average Fuel Economy) norms. Maruti Suzuki reported a de-growth of 1.5% with its domestic sales at 1,45,031 units in Mar’19 v/s 1,47,170 cars sold in Mar’18. 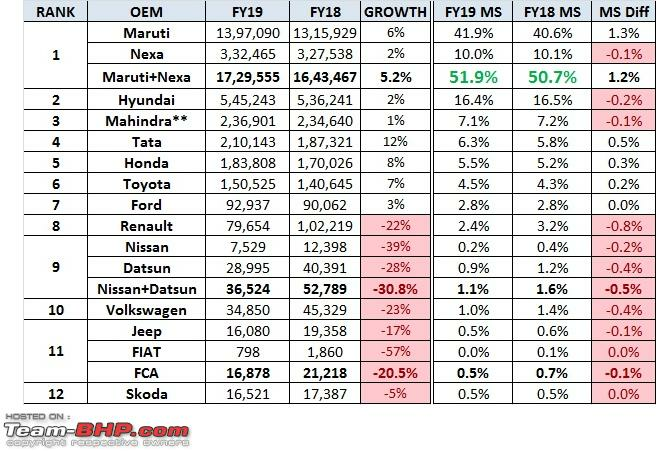 Hyundai de-grew -8% in Mar’19 v/s the same period last year. Even post Santro launch; Hyundai hasn’t gained significant numbers. MPV: Grows at 12% (Y-O-Y). The numbers are backed by Maruti Suzuki’s Ertiga and supported by Toyota’s Innova & Mahindra’s Marazzo. Renault announces TRIBER, a MPV for this segment. Challenging in terms of pricing and packaging as it will take on the established players . Compact SUV: The overall segment grew by 6% YoY. Maruti Suzuki’s Vitara Brezza, with only a diesel offering defies all logic and unbelievable in the volumes churned out every month. Nexon positions itself as the runner up in this segment. Mahindra’s XUV300 shows impressive numbers in its early months, but comes at an expense of drawing volumes from its own TUV. EcoSport feels the effect of Mahindra’s release and is now lower in the sales chart. A segment which needs to be watched as Hyundai launches its VENUE in the coming months. 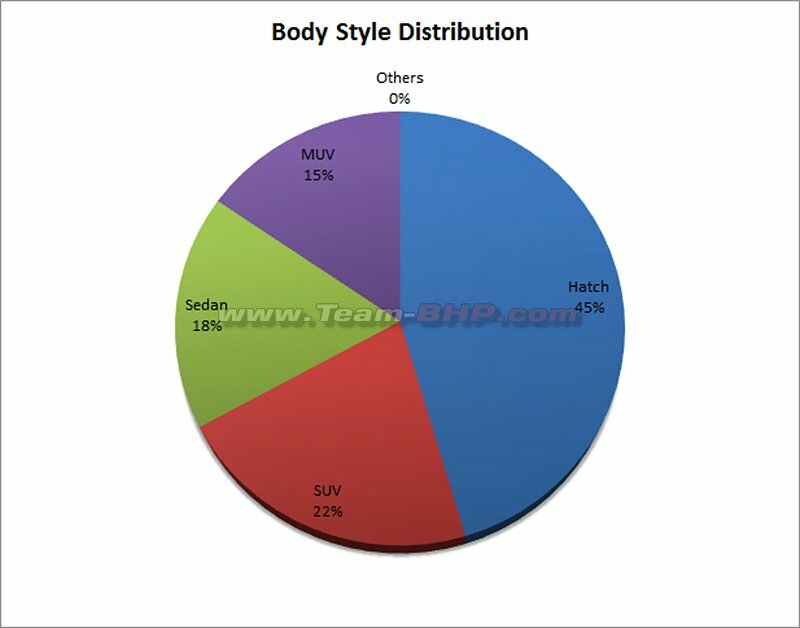 SUV: A segment that is crowded and most competitive sees dominance of Hyundai’s Creta from the time of its launch, even though the segment grows by a mere 4%. Mahindra’s Scorpio continues to churn 5k+ numbers and expected to grow in the coming months due to its rural dominance. Tata’s latest offering in the form of Harrier shows a lot of promise but need to watch as new launches are poised to enter soon. FCA juggles its Jeep Compass variants as its position is threatened with new launches. 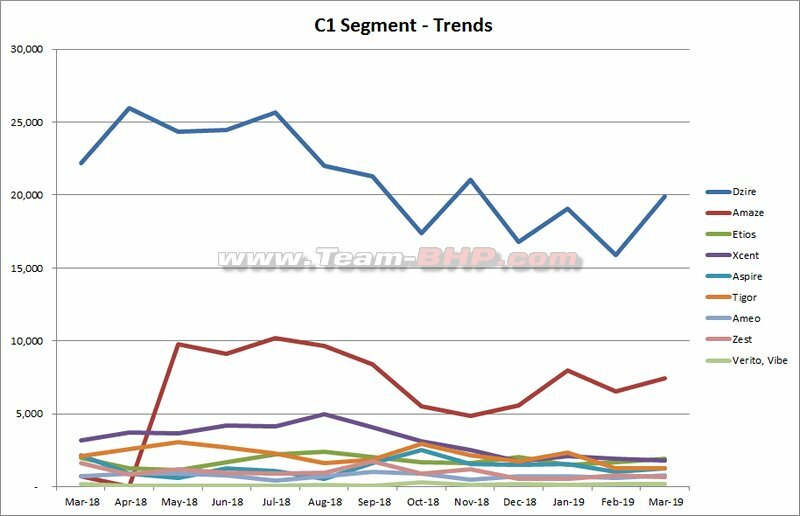 C Segment –Sedan: A segment which is normally skipped by new manufactures and rightly so as the segment de-grows by 12 %.The segment has been slowly shrinking and not a single model in the entire list posted a positive YoY growth in Mar’19! 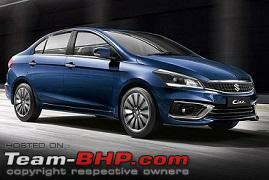 A closely fought segment between Maruti and Honda, sees CIAZ in lead in March. Maruti Suzuki’s Ciaz beats its closed rival Honda City in FY 19( Ciaz -total sales 46,169) by 4,485 units, and 5899 cars more than Hyundai’s Verna. 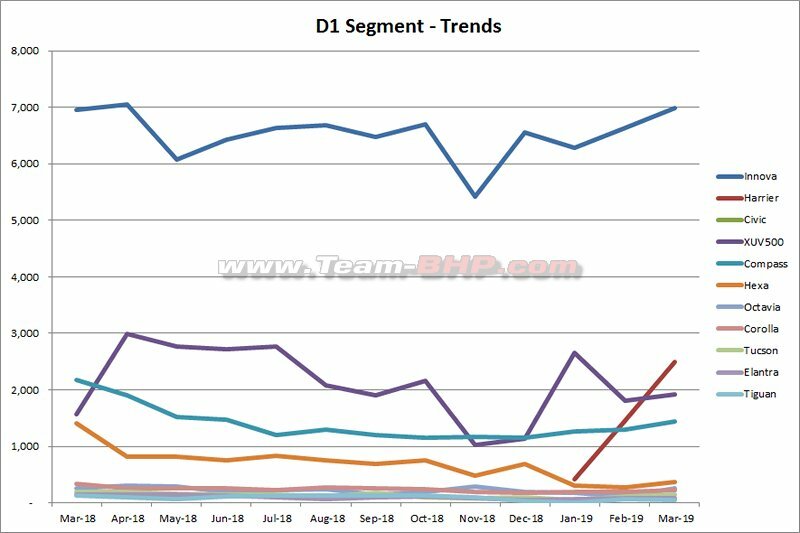 Entry level segment: A fast growing segment in the past is now one of the slowest growing showing a de-growth of 34%. The largest selling of the segment, Maruti Suzuki’s Alto is now pushed to the 3rd position in March-19 sales/dispatches. The entry-hatch volumes are draining down and 2 models mark their exit in FY19! (Nano & Eon), and most manufacturers will skip bringing/ updating products in this segment. With EV’s things could change and revive this segment. The Top 10 selling cars sold a total of 1,43,896 units in Mar’18 and contributed to >50% of overall car sales in India! Last edited by volkman10 : 8th April 2019 at 12:56. Is Nexa an OEM ? Its just a different distribution channel with a different branding. OEM is the one who manufactures - so its all Maruti Suzuki. Good numbers for the 2nd month from XUV300 - I wonder where that share came from because rest of the segment is largely stable. Datsun - What to say, are they not trying or are people not buying? Dump the Go / Go+. Put 100% on Redigo. Fiat - How can a mass market car maker survive by selling 80-100 odd cars each month? Ford - Facelifted Figo fails to generate interest in customers. Aspire & Freestyle sales are falling too. How long can Ecosport keep up the market presence & Endeavor prop up the revenue? HM / Mitsu - I have a question. Why are we maintaining a line item for this? Or are they actually 'reporting' zero sales month on month? Honda - Tremendous show by Civic. Uptick in Amaze and City. Jazz and WRV are two cars which are kept lame by company decision - Jazz is not given a 1.5L engine, WRV is not given an autobox. Hyundai - Creta continues to bring home the revenue, so does Elite i20. The fact that i20 + Creta sales are much more than i10 + Santro + Xcent sales confirms the fact that Hyundai has successfully cracked the premium end of the mass market. Jeep - Give this brand some more cars please. Alo the real estate that is occupied by the Fiat showrooms. Maruti - Alto sales hit a air pocket & Celerio sees a 225% MoM rise- is the new Alto inbound and current Alto orders being converted to Celerio with good offers? Positive MoM sales for most other cars. Nissan - Sharing floor space with Datsun, alongwith the strong penchant against selling cars. Renault - Kwid sales barely keeps this company in black it seems. Infected with the same disease as it's sister brands. Skoda - It may position it's cars as premium ones, but as a brand mentality it is as middle class as it gets - content with what sales it has with nary an appetite for any more. Tata - Is Harrier the magic bullet that Tata needed? Consistent Nexon sales keeps the brand firmly footed. Tiago / Tigor sales consistent, but maybe can do 20% better. Toyota - As long as they have those numbers MoM beside Innova and Fortuner, no use of talking about sales of any other model. VW - A case study on how you can wring out that drop of juice out of bone dry husk called Polo / Vento. Otherwise, shares the same mindset as sister brand Skoda. Last edited by blackasta : 8th April 2019 at 13:14. I feel some part of the C2 segment sedan volume is being taken away by the CSUV and some by the Compact sedan. I will not be surprised if the major portion of sales in the C2 sedan space is from their Petrol models, the diesels are similar to the CSUV/CS. I had been to Nandi hills over the weekend and believe me despite having a CSUV, I sorely missed my Brio. The parking there is a mess and Brio would have fit in about 6-7 slots I could count but the Nexon couldn't. Finally parked the Nexon with one tyre over a step and the remaining car on road, 209mm GC put to use..
Having a large sedans will be a pain to park in such places and not to mention the small bumps I ignored on the way and not have to worry about the large ones. Last edited by aniyo : 8th April 2019 at 13:22. Wasn't Maruti mentioning they were going to cut down production by a considerable % ? Sales charts hardly show any ripple, or would it show on April charts? Datsun/ Nissan - Even the new GO/GO+ could not spell magic. The products are vastly improved but the brand is killing them. Kicks on the other hand is reporting sub-1000 numbers, which a lot of people were anyways expecting. It is a very good product but again, i will not trust Nissan with my money. I don't think, they are here to stay! Ford - Ecosport has again bounced back a little but i think it is short term. In the medium term, XUV 3OO will eat into Ecosport. Honda - Civic numbers are just mind-blowing. 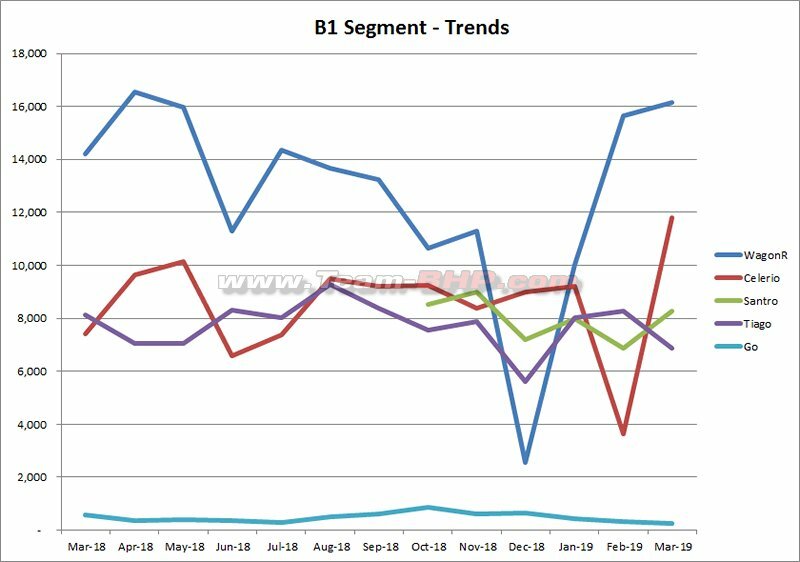 However, i have a feeling that they pushed a lot of cars in March to close FY19 on a good note. 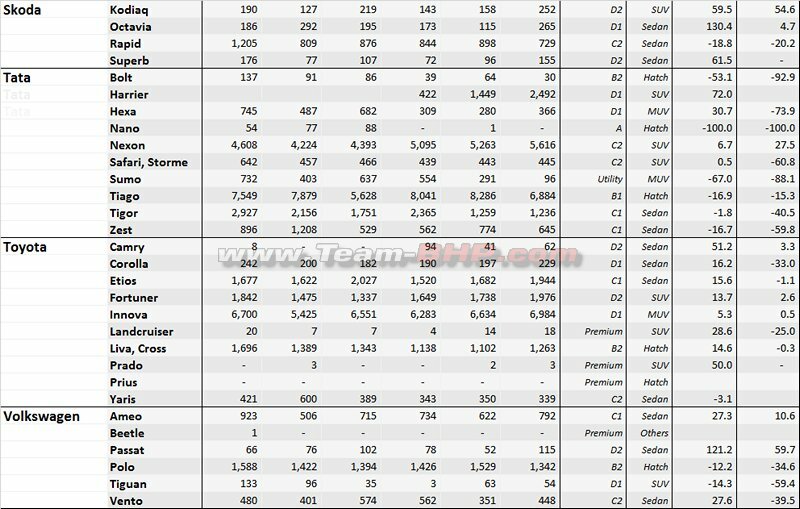 I read somewhere that Civic has raked-in 2,500 bookings so far and looks like Honda has delivered most of them. Sharp downtrend will follow in the next 2-3 months and the numbers will settle around 350-500 units IMO. Hyundai - Santro is now running good discounts (30k? ), clearly shows that Hyundai has been optimistic with the pricing. Now with the discounts, i expect it to clock 10,000 units in the next 1 or 2 months before again settling at ~8,000 units. Tata - Harrier now posting decent numbers, looks like the production has streamlined a bit. This product can clock 2,000+ numbers consistently. Tiago is a surprise this month with less than 7k units. Has the Wagon-r eaten into Tiago or is it just a short term impact for some other reason? Nexon, what a show from this radical looking product. Mahindra - Good to see XUV 3OO growing. I now fear that Nexon might loose its no-2 position in the months to come. It is over priced but well kitted. It can cross 5k units in the coming months. Venue will surely impact it. Ertiga is selling in such large numbers !! 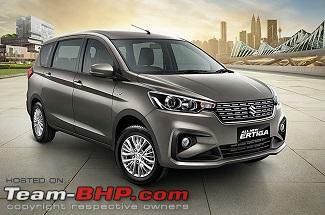 I thought the MPV segment was stable for past 4-5 years and Ertiga was hovering around 4-5K. Looks like the new model is working well for Maruti(or rather balancing the Ciaz/S-Cross sales). Unable to figure out where these numbers are coming from. who is taking the beating ? Numbers & Graphs, oh thy middle name is "ridiculous"! Fiat sells a total of 80 cars and clocks almost 75% YoY change. 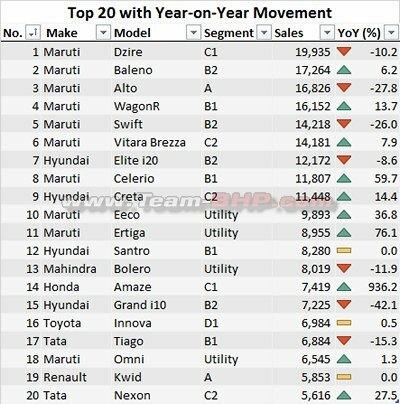 Per annum basis, relatively difficult for a Toyota (worth 23k more cars effort) to displace Honda from the 5th position, for Honda (27k more cars worth of effort) to beat Tata and move to the 4th position, as compared for a Tata (16k more cars worth of effort) to beat Mahindra and move to the 3rd position. A segment, come on Alto. 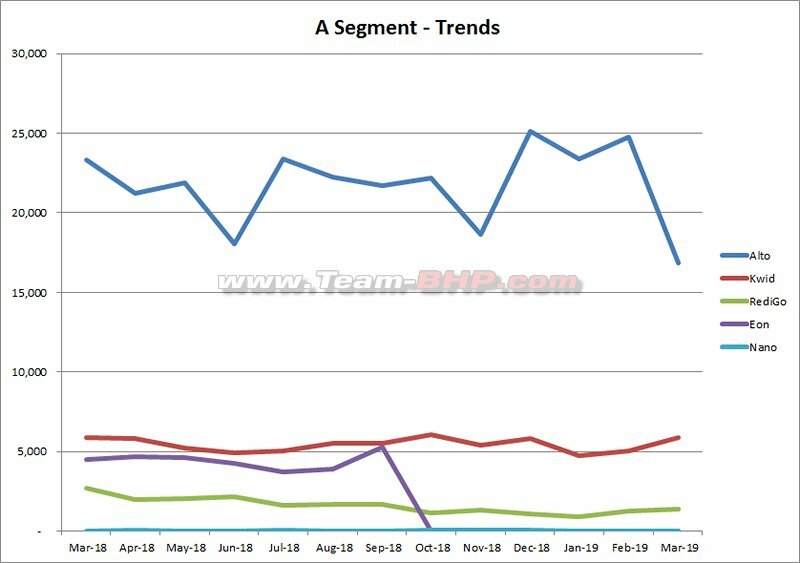 If you don't grow, then look at what's happening to your segment, it has dropped by 50% over the year. B1 segment saw the age-old warriors clocking a robust 30% growth, but with only WagonR and Celerio helping out. 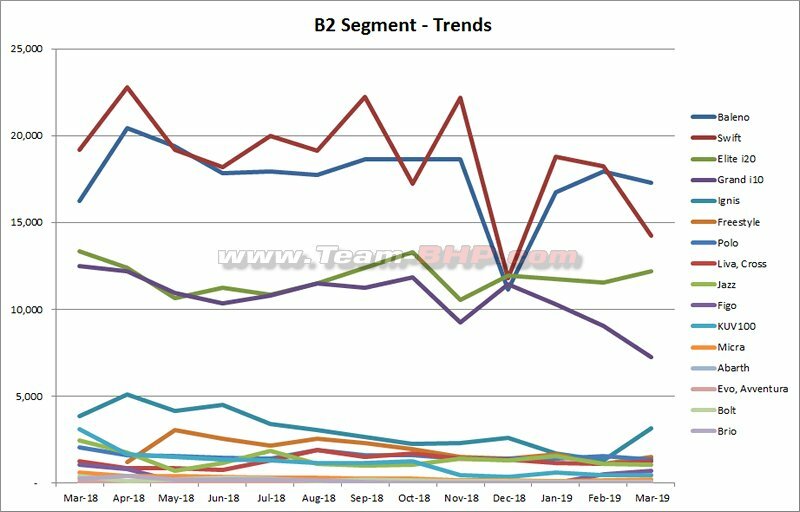 Even B2 saw a huge fall of 20%, what with the "bread & butter" hatches not coming to the rescue of the sales charts. As for the C1 segment, even though the Dzire has now gained the numero uno spot at the end of the year, but it has its share of ups and downs. It need not fear anything from the Amaze, which is at a distant second. 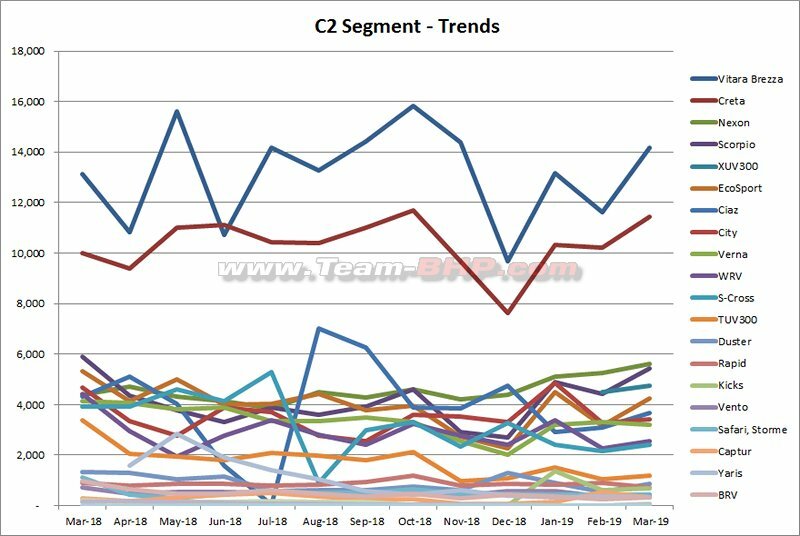 C2 segment was perhaps the most happening in terms of launches et al, yet it dipped by 4.5% in the last year. 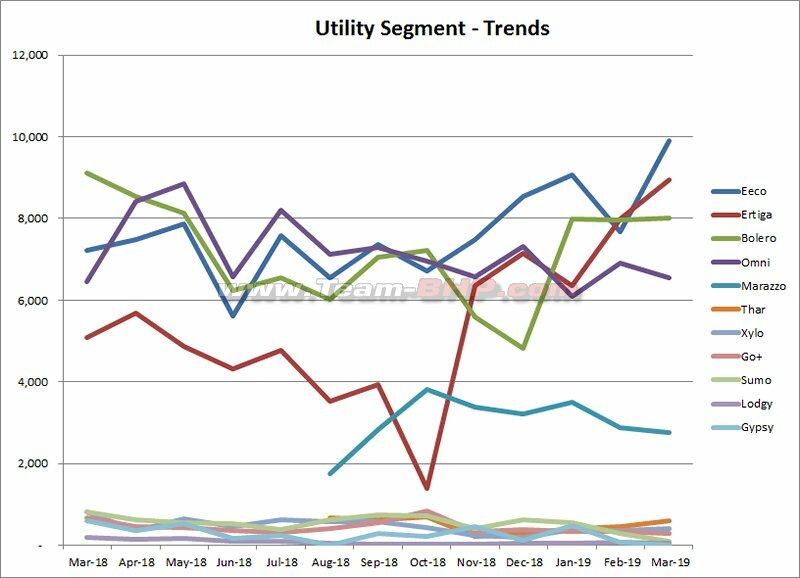 Followed by the Utility segment clocking a respectful 20% growth. However, am sure the decently luxurious Marazzo and the Ertiga will definitely mind a lot being clubbed with the Eeco and an Omni in the same segment. D1 segment. Till now all the grunting used to be done by the Innova and the XUV. But hey, now the Harrier is jostling for space. Year 2020 is going to be the year to watch out in this segment, in my view. 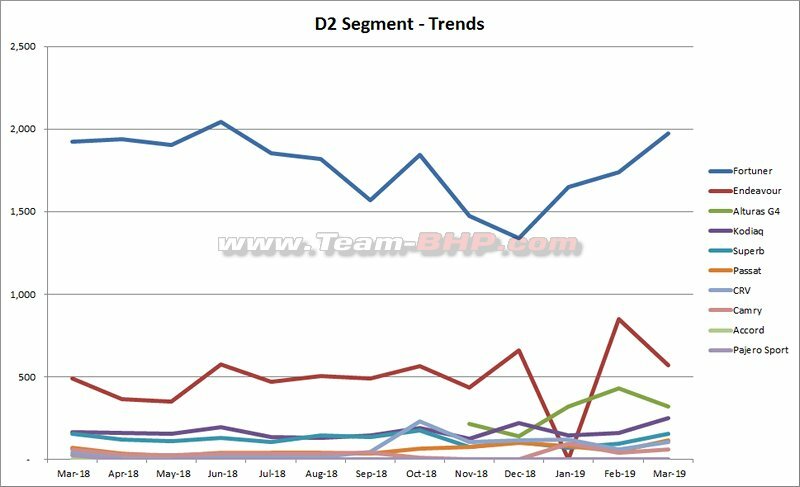 D2 segment at 21% growth. The Fortuner can go to sleep and yet nobody can dare to do anything. Alturas wanted to knock doors with 430+ sales in Feb but decided to go back with 100 less numbers in just a month. The mighty Endy is waiting for the facelift to lift its sales. Kodiaq, here it comes. Premium segment. Hats off to the Mustang. Landcruiser, too much real estate on the road, but heck, it sells neatly. Thanks Aditya for the monthly sales figures for the month of March 2019. 1. Third consecutive month where the total volumes have fallen when compared to the same month previous year, pointing to the pressure the automobile industry is facing. Also the approaching General elections will further cause concerns in the upcoming months. 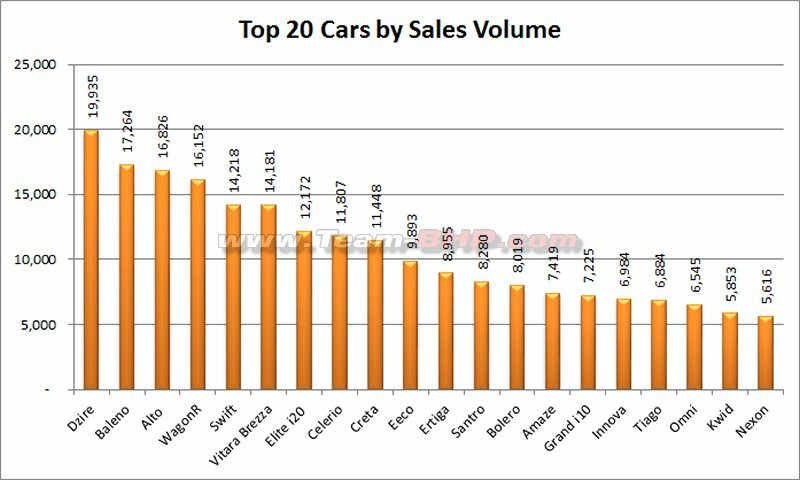 The sad part is most of the volumes lost are from the fringe players rather than the Top 6, which will further weaken the automobile industry leading to monopoly in few segments. 2. MSIL has achieved another milestone by having 8 cars in the Top 10 positions. Eeco is a surprise entrant in the Top 10 and has achieved its career best monthly sales figures, along with Celerio which has hit its second best sales month since launch. Add to that the newly launched Ertiga is just outside of Top 10 at 11th position. 3. 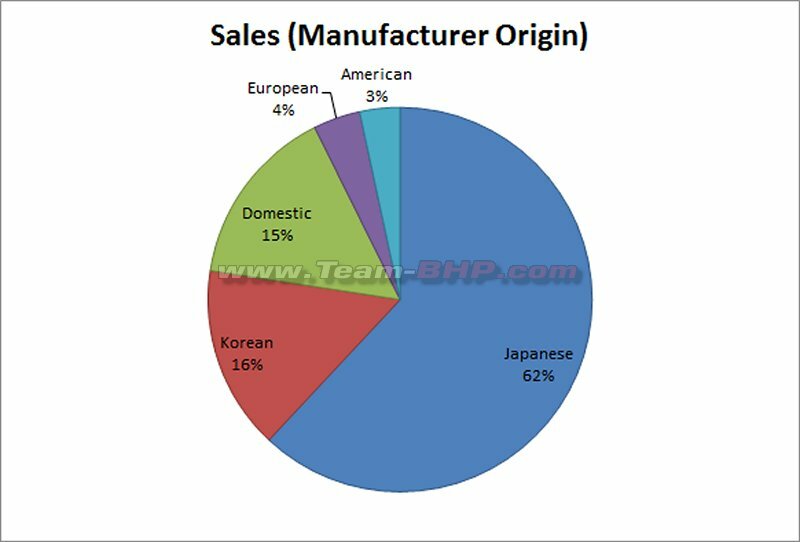 Honda Civic had a humongous start launching with 2,291 units which is almost what the Top 3 C2 Segment sedans sell during their dull months. To put that number in perspective, the segment leader Corolla sold a total of 2,781 units in the last 12 months, whereas Octavia sold 2,624 units and Elantra sold 1,174 units in the same period. 4. 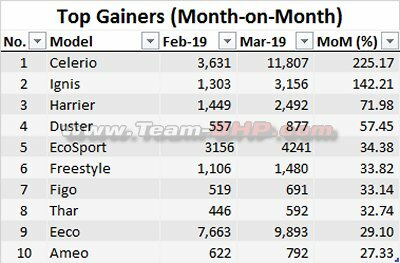 Harrier seems to be on a roll and has already beaten Compass and XUV 500 and I assume that there is still potential for the car to sell more numbers. 5. Another car which has started with a bang and has achieved its life time high once again this month is the new Ertiga, crossing the 8K mark for the first time in its history. Marazzo still able to maintain volume even after the onslaught of Ertiga and Innova seems unaffected by Ertiga. 6. 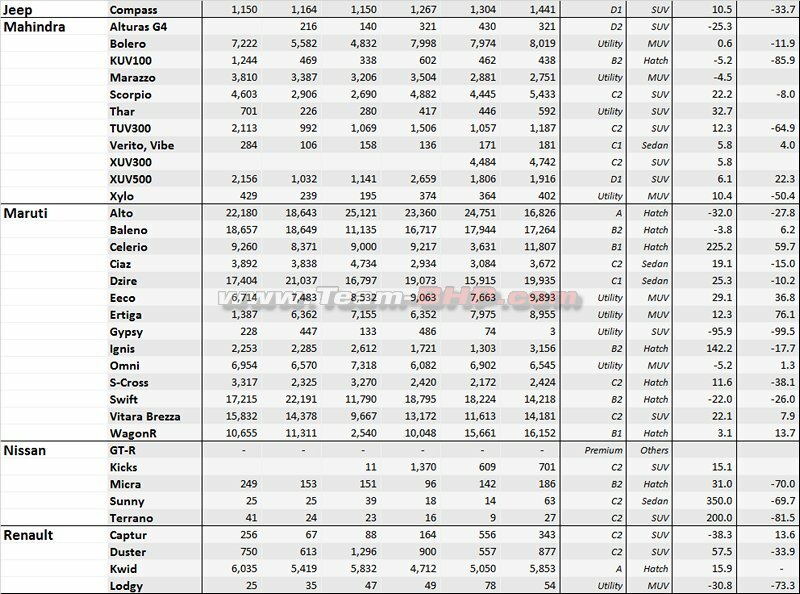 Compared to last month, almost all the cars in the Compact SUV segment have grown in volumes with the new entrant XUV 300 seems to have settled just under 5K which is a very good number. However, the star of the show is the Nexon which is slowly but steadily increasing month after month posting life time high with every passing month, thanks to the 5-star GNCAP rating. 7. Surprisingly, Creta posted its second best month since its launch and marked the 5th instance of crossing the 11K level. On the other hand, Kicks unable to provide any momentum to Nissan and seems another failure. The only consolation is that it was able sell more than what Captur managed when launched here. 8. Ciaz has only just about managed to wrestle back the top position in the C2 segment sedan, the facelift failed to achieve the levels of its predecessor. 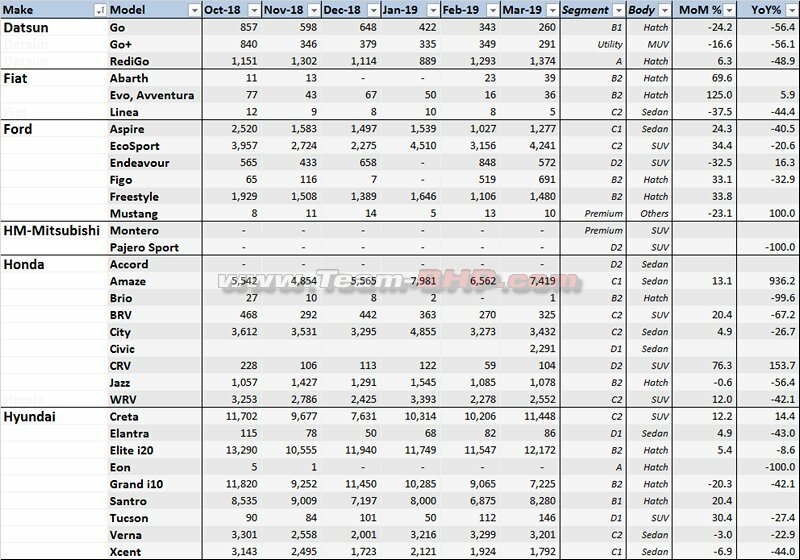 Interestingly, all the 3 cars - City, Verna and Ciaz has managed to top the segment in the first 3 months of 2019, in that order. 9. Impressive show by Alturas, when the market expected it to be sales dud - selling almost two-third of Endeavor at that price bracket is really good. Compare this with the CR-V, which has already lingering around the 100 units mark. 10. 3rd worst month for Grand i10 since its launch in Aug 2013, the last time it touched 7K levels was also way back in Sep 2014 when it sold 7285 units. 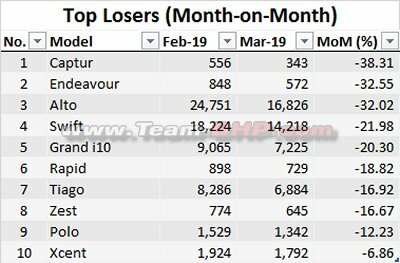 Coupled this with the 2nd worst ever month for Xcent since its launch in Mar 2014, Hyundai has lost a chunk of volumes when compared to last year. And first time since launch, Santro has sold more than Grand i10. 11. 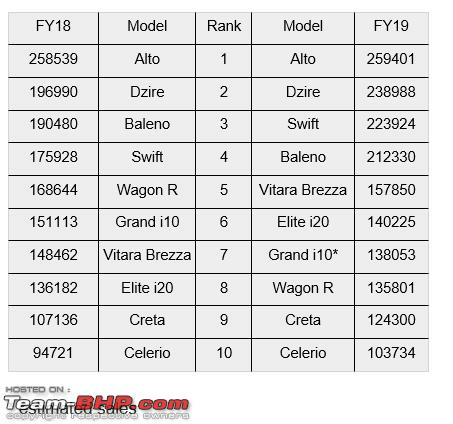 BAU elsewhere - Dzire once again taking up the top position in the overall sales chart, the new gen Wagon-R started brilliantly, the facelifted Baleno maintaining its sales similar to that of pre-facelift version and Amaze is continuing its amazing run. A look at the Top 25 cars during the month of March, in the past 10 years. 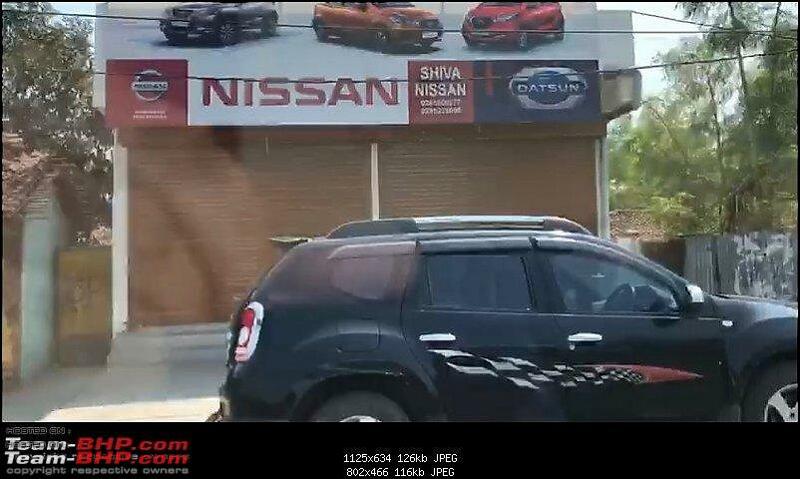 This should certainly qualify as case study, that you cannot sell the same car(same engine and platform) with 4 different names (Duster, terrano, Captur and kicks). Indian consumers are well educated and qualified to know the the actual fact. Never seen such a disastrous response after a new product launch in the automobile industry with any OEM. 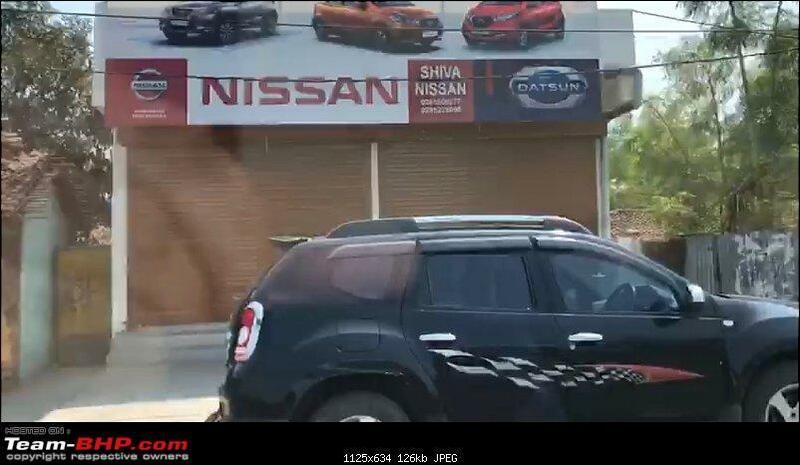 Most of the dealers from North India have taken KIA dealerships and now, they have started liquidating their stocks to close down their Nissan dealerships. Few dealers are ready to sell their stock of Nissan Kicks with discount of approx Rs. 60000/- (ready to give up their margins of approx 40000 plus 20000 additional) just to liquidate their stocks. Some of them have shifted their dealership setups into tiny shops. No way Nissan can survive with one product, and 2 other ancient cars which are only finding buyers among cabbies despite massive discounts.They will exit the scene by 2020, specially after KIA enters the market in a big way this year (their SP Concept with a massive list of tech and all-new contemporary design will most certainly kill the Kicks, and eat into Creta and S-Cross heavily). All times are GMT +5.5. The time now is 12:08.